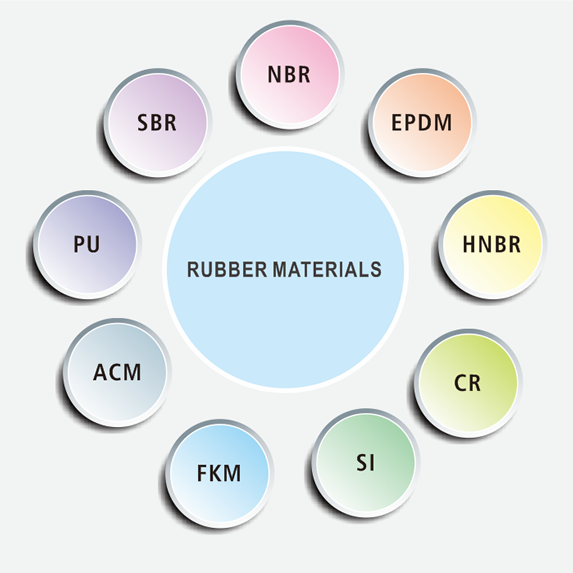 How To Choose The Right Rubber Materials? We can customer all rubber materials from the product development to the material selection. Ambient temperature: from the maximum to minimum temperature. Contact material: Grease, liquid, gas or chemical. Work status: The rubber function and lifetime will be influence by the stretch, compression and dynamic/static state. Design consideration: Product production/assembly and responses. Product standard: In compliance with international standards (AS568, JIS B 2401 and so on). Cost consideration: The production costs are different for all rubber materials, which should be selected to meet the benefits. Acceptance examination: Define the acceptance target, and produce according to the sample. Rubber materials with grease resistance, suitable for circulating oil and lubricant. Good compression set and wear resistance. Applicable temperature: -30oC to 100oC. Disadvantages: Poor climate and ozone resistance. Good hydrophile, climate and ozone resistance. Not suitable for the working environment in contact of grease (such as fuel oil, mineral oil and grease). Applicable temperature: -40oC to 130oC. Disadvantages: Poor compression set and wear resistance. Good grease and low-temperature resistance. Applicable temperature: -25oC to 150oC. Good climate, grease and ozone resistance. Applicable temperature: -45oC to 100oC. Good thermal, climate and temperature performance, waterproof and elasticity. Applicable temperature: -50oC to 200oC. Disadvantages: Poor tensile strength and peel strength, not suitable for the working environment in contact of grease. Good ozone and high-temperature resistance. Operating temperature: -10oC to 160oC. Disadvantages: Poor elasticity, compression set and low-temperature resistance. Good mechanical property, high elasticity and wear durability. Good aging, ozone and grease resistance. Operating temperature: -40oC to 100oC. generation of more toxic gas when burning PU. Mainly applied for tire industry, shoe soles, sporting appliances and conveyors. Wear/aging resistance, waterproof, non-deforming in high hardness. Operating temperature: -30oC to 70oC. Disadvantages: no acid, ozone and grease resistance.